Amazon has introduced an electronic reading device called Kindle. I ordered one and have been playing with it and am finding it an interesting device. Kindle is basically an e-book reading device, but in practice it is more than just that. 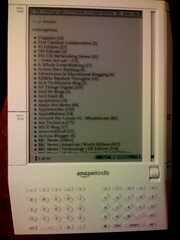 It is more like a portable book buying and display machine with a very basic web browser thrown in. It employs a EVDO cellular modem to connect to the Amazon site (or other web sites...) where you can purchase books or download other content. In addition you can convert your own files and send them to the Kindle. While buying books from Amazon is its main function, you are not really purchasing books, but rather the ability to download an electronic version of the book to the device. Unlike a real book you can't resell a Kindle ebook, or loan it out. The trade off is that you pay less for this version of the book, $9.99 for New York Times Best Sellers, but less for older titles. You can also download samples or excerpts and read them before you buy the full book. You can also put other reading content on the device. For example, I visited the Gutenberg Project web site and downloaded a free text copy of Mark Twain's, Life on the Mississippi and put it on my Kindle. To do this I needed to email the text file that I got from the Gutenberg Project to my Kindle email address, where it was converted to the Kindle format. A few minutes later I received an email with a link to the converted file and was able to download a copy of the book that I could put on my Kindle. You can also use Kinkle bare bones browser to access the Gutenberg html version complete with graphics and illustrations. There has been quite a bit of talk about the look of the device. Many folks have lamented that the design looks ugly. While the form factor looks a bit funny, the actual experience holding it is something else. It is light and the angles make holding it easy on your hand and the controls are easy to manipulate. You turn pages by pushing a long button on the side of the device. The experience of navigating the text on the screen is different from most hypertext environments. The screen utilizes electronic ink which is much different than an LCD. The screen is redrawn once for each page turn or screen change. This technology uses much less energy than an LCD and this results in battery life that is really quite good. Two days with the EVDO modem on, but over a week if you turn the modem off. The E-Ink technology is not like an LCD so you have to navigate to links with a scroll wheel that moves a marker up and down the side of the page. When you get to something that is a link, or you would like to annotate, you press the scroll button and are then presented with a small window adjacent to the scroll column with choices associated with that section of the page. You then scroll again until the scroll indicator is next to the option you want and then press the scroll button again to execute the request. Much has been made about being charged to upload content via email. It should be noted that you can upload files for conversion to the Kindle format and then download them ( as mentioned above...) and move them to the Kindle via the USB interface. This method does not have any charges associated with it. You simply email the document to a unique Kindle email address. You have two Kindle addresses, one for conversion and transfer via USB, and one for conversion and transfer via the EVDO wireless network. They charge you ¢10 to wirelessly send the file to your Kindle, but there is not cost to convert and transfer via USB. I tried this with some PDF files. Like most administrators, I have a shelf full of binders full of documents from my school district. Things such as our district administrators' handbook, our discipline handbook, and the union contract, just to name a few. I simply emailed the PDF files to my Kindle email address and the files were sent back converted to the Kindle format. I then transfered the converted files to the Kindle via the USB cable. Now I have access to the contents of these documents and can use the Kindle's search feature to look up information. Being able to quickly look up and reference my own content, in a small and convenient device, is the main reason I bought the device and it is proving to work as I had hoped. Amazon is also advertising the ability to subscribe for a fee to RSS feeds from popular weblog sites. I have read comments that have complained about Amazon charging to access RSS content. It should be noted that with the Kindle web browser you can easily access sites such as Google Reader and connect to RSS feeds in this manner. I was able to access Google Reader and pull up and read my RSS feeds. Sites that have been optimized for mobile devices work quite well. It should be noted that the web browser is found under a heading called Experimental. You aren't going to use this thing to watch YouTube, but for content that is mostly text, like blogs, it works pretty well. As many folks have mentioned, if a college student could get her text books on this thing, well then you would really have something. The Kindle is a glimpse of what is coming. (It will be interesting to see what developers and hardware makers do with Google's Android environment. ) It is not for everyone, but I'm liking it and find it useful.